Millions of displaced people across the world were unable to return home in 2017, while new and heightened crises drove many more to flee. The number of displaced persons worldwide reached a record high of 65.6 million as of the most recent 2016 year-end data, including 22.5 million refugees receiving protection outside their countries of origin. Roughly half of these refugees had been displaced for at least five continuous years. And 55 percent of all refugees came from just three countries: Syria, Afghanistan, and South Sudan. With just 190,000 resettlement places offered for refugees worldwide in 2016, demand has far outstripped supply, translating to a tremendous burden on first-asylum countries in the affected regions (for more on refugee resettlement worldwide, see Issue #6: In Wake of Cuts to U.S. Refugee Program, Global Resettlement Falls Short). Turkey, Pakistan, Lebanon, and Iran, to name a few countries of first asylum, continue to host massive displaced populations unable or unlikely to move on or return. In addition, a number of ongoing conflicts in Southeast Asia and sub-Saharan Africa intensified during 2017, driving out hundreds of thousands and placing further pressures on neighboring host countries. 2017 saw the simultaneous flareup of several conflicts that have intermittently driven refugee flows since the beginning of the decade. The flight of Muslim-minority Rohingya from Myanmar to Bangladesh was the most visible of these. From late August to mid-November, approximately 624,000 Rohingya fled a military campaign led by Buddhist nationalists, purportedly to stamp out insurgents, that spiraled into violence, destruction of villages, and widespread human-rights abuses. While the latest violent outbreak is notable for its scale and severity, clashes between the stateless Rohingya and Buddhists in Myanmar’s Rakhine State are not new, having caused periodic bouts of mass displacement since 2012. The latest arrivals joined Rohingya refugees already in Bangladesh, bringing the total there to 835,500 as of November 25. Meanwhile, in Central and East Africa, several ongoing conflicts intensified, rooted in decades-old feuds along political and ethnic divisions. The most significant case is South Sudan, home to the fastest-growing refugee crisis in 2017. Widespread violence broke out in 2013 after a political struggle between President Salva Kiir and former Vice President Riek Machar—who belong to the two largest ethnic groups in the country—led to a split in the military along ethnic lines. By the end of 2016, the civil war had driven 1.4 million people into neighboring countries, and through the first ten months or so of 2017, another 668,000 people left. Food shortages resulting from the interaction between drought and violence drove much of the displacement. More than 1 million people faced starvation as of November, and 6 million people—half of the country’s population—were in severe hunger. In the Democratic Republic of the Congo (DRC), Central African Republic (CAR), and Burundi, ongoing violent struggles produced roughly 220,000 combined cross-border refugees in 2017, and hundreds of thousands more were internally displaced. Though political upheaval is a common trigger for displacement in Central and East Africa, these crises frequently have deeper roots. In South Sudan, military units were established along ethnic lines during the decades-long civil war that preceded independence in 2011. When political tensions boiled over in 2013, these units turned against one another. In eastern DRC, armed ethnic groups—the cross-border remnants of the 1994 Rwandan genocide—have fought over control of resources since the early 2010s. And in south-central and southeastern CAR, armed groups of Muslims on the one hand, and Christians and Animists on the other, have terrorized civilians along religious lines since 2013. This pattern escalated in May 2017 after Ugandan troops and U.S. military advisors pulled out of the region. The prominence of deep ethnic divisions in these regional conflicts suggests a high likelihood of cyclical violence, which re-emerged to cause significant refugee flows in 2017. At the same time, ethnic rivalries are often concentrated in localities or provinces rather than tearing apart entire countries, creating a situation where one country is simultaneously a source and recipient of refugees. The large-scale flows of 2017 overwhelmed already strained protection systems across Africa. Many African first-asylum countries rely on aid from the UN High Commissioner for Refugees (UNHCR) and international donors, as they lack resources to provide for even the basic needs of refugees. Severe funding shortfalls threaten the humanitarian response: Among the refugee situations described above, UNHCR funding calls for South Sudan had reached just 40 percent as of October 2017; in the worst-case scenario, just 6 percent of the funding appeal for Burundi had been achieved. As it is nearly impossible to provide sustainable livelihood opportunities in refugee camps, protection seekers often struggle to survive, and in some cases must decide whether to return to dangerous situations in their countries of origin or seek opportunities farther afield to feed their families. Uganda, the main host of South Sudanese refugees, runs one of the world’s most progressive systems for refugee livelihood provision. Under this system, the government gives refugees plots of land, food rations, and materials to build shelters and grow food. Refugees also have access to public education and health care under the same terms as Ugandan nationals. But after receiving more than 1 million refugees since July 2016—the vast majority women and children—this system is under severe strain. Even as Uganda’s Bidi Bidi camp became the largest in Africa, UNHCR received just 32 percent of its funding request to support refugees in the country. This funding gap forced Uganda to reduce food rations to levels that beneficiaries have described as insufficient, and some refugees have risked their lives by returning to South Sudan in search of food. As the second-largest refugee host in Africa, Ethiopia provides refuge for more than 880,000 Eritreans, Somalis, Yemenis, and South Sudanese. Most live far outside large cities, in UNHCR-run camps that lack sufficient livelihood opportunities. As of late October 2017, just 27 percent of UNHCR’s Ethiopia funding request had been met, increasing the strain on the Ethiopian government and local populations, and leaving refugees in highly vulnerable situations. Despite this challenge, in October 2017 the Ethiopian government began to record refugee life events, including births, deaths, and marriages, in its civil registry, in line with the Comprehensive Refugee Response Framework signed at the Leaders’ Summit on Refugees in September 2016. This step may foster greater integration of refugees into formal employment and Ethiopian society more broadly. Outside Africa, top refugee hosts responded in divergent ways as displacement stretched into another year. Turkey, which hosts the world’s largest refugee population, has moved to undertake a strategy to deepen the integration of its 3.2 million Syrian refugees, while simultaneously attempting to cut off future arrivals. In 2017, it entered the second year of its three-year program to move all Syrian refugee students into Turkish public schools, and launched the Conditional Cash Transfers for Education program to tackle the problem of child labor by providing bimonthly stipends for families whose children regularly attend school. Meanwhile, Turkey has been building walls along its borders with Iran, Iraq, and Syria, to ensure its refugee population does not grow. At the same time, other top hosts around the region put pressure on refugees to return home. In Lebanon, Syrians faced rising discrimination as most political parties pushed for their removal. Between June and October approximately 10,000 Syrians returned from Arsal, Lebanon under possible coercion. And in both Lebanon and Jordan, refugees were subject to frequent police raids, detention for alleged contact with terror groups, and deportation. Jordan began deporting entire families for the first time in mid-2017, after security crackdowns following terrorist attacks in June and December 2016. In each month of 2017, Jordan deported roughly 400 registered Syrian refugees, while 300 left voluntarily, and another 500 returned under unclear circumstances, according to Human Rights Watch. As political will to end refugee protection grows, coerced returns will likely continue, calling into question host countries’ commitment to the principle of nonrefoulement (for more on returns, see Issue #7: Increased Focus on Forced Return of Migrants and Asylum Seekers Puts Many in Peril). Heading into 2018, and with few signs that the conditions driving mass displacement are likely to abate any time soon, many regions are adjusting to a new normal. As the Syrian conflict entered its sixth year in 2017, some host countries in the immediate region are investing more in integration, while at the same time reinforcing borders; meanwhile, others are coercing growing numbers to return. And in Africa and Southeast Asia, tensions have continued to foster mass displacement, which may soon overwhelm even the most generous host countries and force refugees to return home or seek livelihood opportunities farther away. In the coming years, offering displaced persons in search of protection a way to make a living in first-asylum countries will likely become even more important, as displacement situations stretch on with little hope of resettlement or return. BBC News. 2017. Uganda Receives One Million South Sudan Refugees. BBC News, August 17, 2017. Available online. ---. 2017. How South Sudan Refugees are Boosting Uganda’s Economy. BBC News, November 7, 2017. Available online. Council on Foreign Relations. 2016. Understanding the Roots of Conflict in South Sudan. Council on Foreign Relations, September 14, 2016. Available online. ---. N.d. Violence in the Democratic Republic of Congo. Accessed November 16, 2017. Available online. Daily Sabah. 2017. Wall on Syrian Border to be Finished by October. Daily Sabah, September 23, 2017. Available online. European Commission. 2017. EU Launches Education Programme for 230,000 Refugee Children to Attend School in Turkey. Press release, March 16, 2017. Available online. Gurcan, Metin. 2017. Turkey’s ‘Great Wall’ Nearing Completion. Al-Monitor, July 14, 2017. Available online. Human Rights Watch (HRW). 2017. Jordan: Syrian Refugees Being Summarily Deported. HRW, October 2, 2017. Available online. ---. 2017. Central African Republic: Civilians Targeted as Violence Surges. HRW, October 27, 2017. Available online. Inter Sector Coordination Group. 2017. Situation Report: Rohingya Refugee Crisis – Cox’s Bazaar, November 26, 2017. Updated November 26, 2017. Available online. Khalid, Saif. 2017. Cox’s Bazaar: Chaos All Around at Rohingya camps. Al Jazeera, September 18, 2017. Available online. Mednick, Sam. 2017. More Than a Million People in South Sudan Are on the Brink of Starvation. Associated Press, November 7, 2017. Available online. Newland, Kathleen. 2015. Irregular Maritime Migration in the Bay of Bengal. Washington, DC: Migration Policy Institute and International Organization for Migration. Available online. Norwegian Refugee Council (NRC) and Internal Displacement Monitoring Centre (IDMC). 2017. DR Congo Has World’s Highest Number of People Fleeing Conflict Internally. NRC and IDMC, May 22, 2017. Available online. Patinkin, Jason. 2017. Hungry South Sudanese Refugees Risk Death in Return Home for Food. Reuters, November 8, 2017. Available online. Sewell, Abby. 2017. Syrian Refugees Return from Lebanon Only to Flee War Yet Again. News Deeply, October 11, 2017. Available online. Sherlock, Ruth. 2017. In Lebanon, Syrian Refugees Met with Harassment and Hostility. National Public Radio, September 2, 2017. Available online. Su, Alice. 2017. Why Jordan Is Deporting Syrian Refugees. The Atlantic, October 20, 2017. Available online. UN High Commissioner for Refugees (UNHCR). 2017. Global Trends: Forced Displacement in 2016. Geneva: UNHCR. Available online. ---. 2017. Highlighted Underfunded Situations in 2017. Geneva: UNHCR. Available online. ---. 2017. 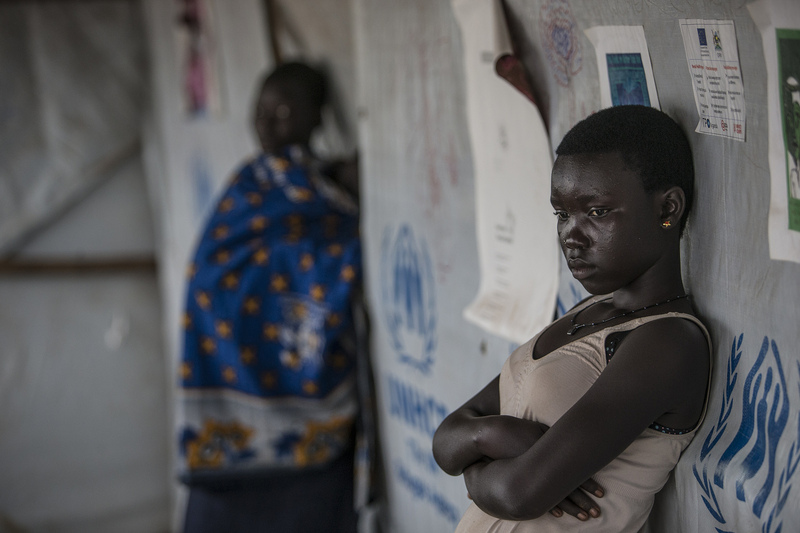 South Sudanese Refugees in Uganda Now Exceed 1 Million. UNHCR, August 17, 2017. Available online. ---. 2017. Home Is Close, but So Far Away for Central African Republic Refugees. UNHCR, October 12, 2017. Available online. ---. 2017. Civilians in DRC Struggle for Survival Amid Growing Violence at Home. UNHCR, October 24, 2017. Available online. ---. 2017. In a Historic First, Ethiopia Begins Civil Registration for Refugees. News release, October 27, 2017. Available online. ---. 2017. Rohingya Emergency. Last updated December 11, 2017. Available online. ---. 2017. Burundi Situation. Last updated December 11, 2017. Available online. ---. 2017. Comprehensive Refugee Response Framework: Ethiopia. Accessed November 16, 2017. Available online. ---. 2017. Ethiopia: 2017 Funding Update as of 27 October 2017. Last updated October 27, 2017. Available online. ---. 2017. South Sudan Situation. Last updated November 30, 2017. Available online.